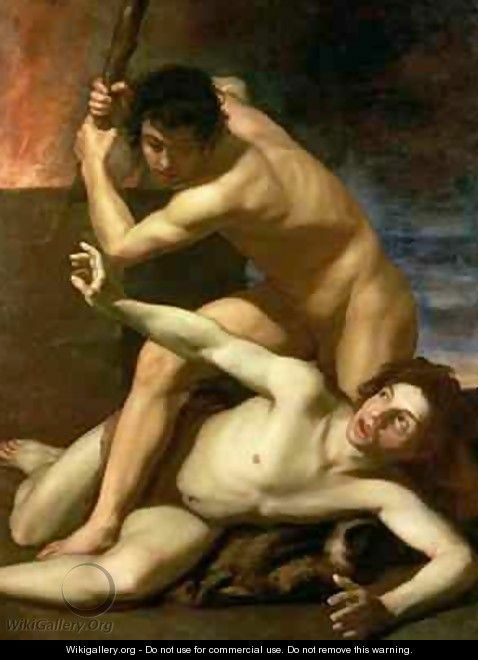 Bartamoleo’s 1611 portrait of Cain murdering Abel illustrates an article in the Wall Street Journal last weekend about a kinder and gentler world. Violence Vanquished, by Steven Pinker, makes an argument most of us would find hard to believe, especially after watching the evening news. The Harvard professor of psychology says violence is actually decreasing. Forensic anthropology, for example, reveals that before governments as many as 15% of people died violently. And since 1300 the number of people per 100,000 that were murdered has dropped from almost 60 in parts of Europe to less than two or three today. Ancient graves apparently are filled with decapitated and crushed skulls, embedded arrow-heads and other signs of how little life was valued. And even war is declining, with fewer people dying now than at any time since the 1940s. Pinker cites many causes for this, from government itself to the mutually self-serving interests of trade. He traces five trends that account for this in his new book, The Better Angels of Our Nature. Many of these make sense, such as the role of government. The Scripture says kings “bear not the sword in vain,” and while Pinker makes little effort to deny that rulers can be unjust, it is not in their interests to kill the people who pay taxes. The cliché that the 20th century was the most violent in human history can not be sustained, however. Even the World Wars can not match the violence of ancient empires. And judicial torture had been discarded by the 18th century, at least in the west, hence the prohibition of “cruel and unusual punishment” in our own constitution. As one becomes aware of the historical decline of violence, the world begins to look different. The past seems less innocent, the present less sinister. One starts to appreciate the small gifts of coexistence that would have seemed utopian to our ancestors: the interracial family playing in the park, the comedian who lands a zinger on the commander in chief, the countries that quietly back away from a crisis instead of escalating to war. For all the tribulations in our lives, for all the troubles that remain in the world, the decline of violence is an accomplishment that we can savor—and an impetus to cherish the forces of civilization and enlightenment that made it possible. That’s why even though our age might seem utopian compared to the Middle Ages, it’s not. Sin still “crouches at the door.” And the forces of civilization Pinker says we might cherish can be attributed to the church as easily as to the enlightenment. Real change comes from the inside out, and only from the transformative power of the Gospel. Self-serving restraint is no salvation, and while the benefits of government and commerce are palpable they are not permanent. War and greed are still crouching at the door. This is the motivating principle of democracy itself, since it teaches us no man can be trusted too little or for too long. Cain is still our brother, after all. And the family resemblance is very strong. I was raised to never criticize or correct my betters or my elders (of which you are only one) but… I believe the word is “couching”. but that doesn’t make me a better. Thank you for mentioning this. Our world is far from perfect. But I firmly believe it is less violent than it was before. I kind of disagree. People might die less violently today than they did in the past, if you believe getting dying from IED’s, suicide bombers, nukes, or gas is less violent than getting your head smashed in. Maybe its better to kill quickly (I know I would rather die from a bullet or an instant-death explosion than the rack or getting beaten to death.) But killing quickly doesn’t really matter when more people are killed quickly. More people have died in the 20th century than previously in history. Its supported by the figures (http://www.hawaii.edu/powerkills/DBG.CHAP1.HTM) and by logic: you can’t kill as many people with spears, swords, or matchlocks, as you can with tanks and bombs. The world is getting worse, not better, as it has always done. And governments are the main killers of people, not individual psycopaths. The deaths in past centuries are measured in thousands, maybe hundred thousands….the deaths in the 20th century are pretty much always in the millions, sometimes even tens of millions. (http://www.hawaii.edu/powerkills/WSJ.ART.HTM). The author of this book must have slept through the last hundred years. My disagreement is focused at the author of the book, I agree with your conclusion. I’ve not read his whole book, but I expect he is thinking in terms of percentages—the number killed divided by the total population. I’m not defending his conclusion here. My (theological) point is that the human heart is still fallen.